…fabulous recipe for sauerkraut soup! 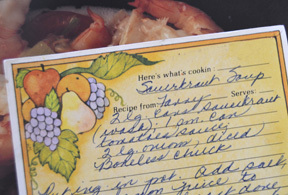 One of my favorite recipes of hers is for Sauerkraut Soup. Most people would never think of making soup from this unusual delicacy. But you would be amazed how delicious it is! Her recipe combines the tang and texture of sauerkraut with meat to balance it out, plus a little lemon juice and honey. I like to add dried mushrooms. Complex flavors and textures that work so well together! Every once in a while I have a craving for it. Also this summer, in my attempt to find various ways to preserve my summer’s harvest, I came across recipes for making cultured vegetables. The most common one is to make sauerkraut using only a few simple ingredients: shredded cabbage, salt, water. The good bacteria on the cabbage cause fermentation that turns ordinary cabbage into crunchy, tangy and super-probiotic sauerkraut. So, what’s Sauerkraut Soup without good ol’ Jewish Rye bread? I used to make it regularly when I lived in Sarasota, but when I moved to high altitude Denver I gave up in exasperation. But last weekend I got brave. 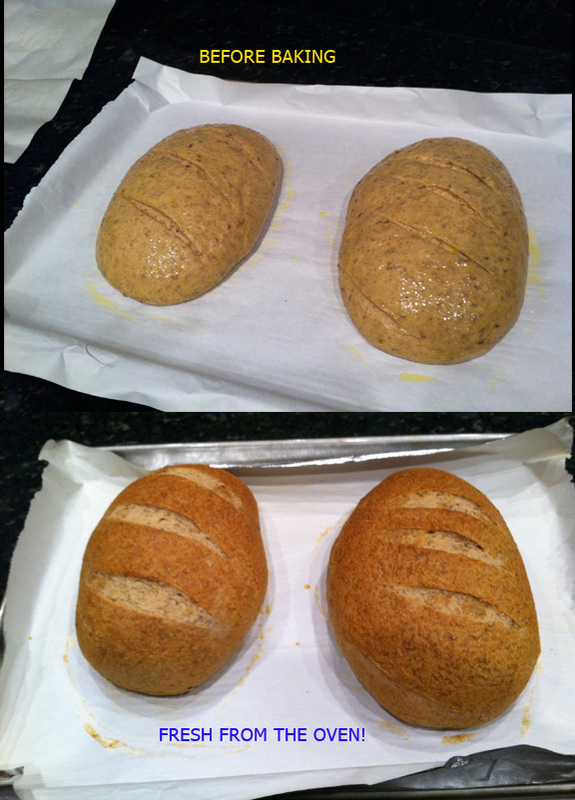 I found a great Hungry Mouse rye bread recipe and high altitude baking adjustments here. Sunday I pulled all of the ingredients together, spent a couple of hours mixing, kneading by hand, etc. and was ready to put my two little masterpieces into the oven. But… my gas oven would not—gasp—turn on! The stove top worked, the broiler worked, even the self-cleaning setting worked. But it would not BAKE. Wow. With great disappointment I put my two loaves into big baggies, placed them carefully in the freezer and wished them luck. On Monday I had a repair person take a look at the oven. It was a striker mechanism that had burned out after 15 years of use. $200 dollars later I was back in business. I took one of the frozen loaves out of the freezer and set it on parchment on a cookie sheet. I raised the sheet off the counter to allow the bread to defrost on the bottom as well as all sides. Two or three hours later it was defrosted and had risen a little more. I put some boiling water in a glass baking tray on the bottom shelf of the oven (to make up for our extremely dry air), hand-wiped the bread with raw egg mixed with water and proceeded with the baking directions. About 45 fragrant minutes later I pulled a perfectly browned loaf of bread out of the oven. It lasted about one day in my house. I just pulled the second loaf out of the oven the next morning, repeated the above and had another gorgeous loaf. They were the perfect accompaniment to the soup and also made for fantastic toast in the morning. My thanks to Fanny and the foodies on the Internet that keep me cooking and eating great food! Update: On my second batch I reduced the oil to one TB and added the raw egg/water coating to make a crisper crust and it worked beautifully! Rich and flavorful with a variety of textures: this is one delicious soup that you'll never find in a can, or at Panera. Sauté onion in olive oil. As it softens, add meat and sauté until brown. Add sauerkraut, water or stock, mushrooms and tomato sauce and simmer for 30 minutes. Add lemon juice (about 1 tbsp or so), honey, salt & pepper to taste. Let simmer for another 30 minutes or so to merge flavors. Serve nice & hot with a good crusty bread. 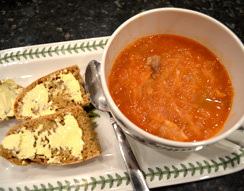 This entry was posted in baking bread, cultured vegetables, high altitude rye bread, making sauerkraut, rye bread recipe, the best sauerkraut soup recipe on January 31, 2013 by Farmer Deb.